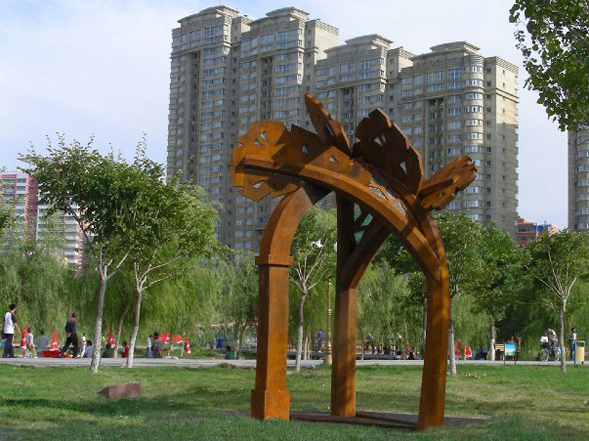 Materials - corten steel, cast glass, height 4.5m. Fabricated in the Beijing YiDongYuan Sculpture Centre, under the supervision and assistance of sculptor Zhaolei - to our detailed design drawings, maquette and our cast glass sample of modelled butterflies. Trees and architecture inspired the work, cathedral interiors with their tree like columns, and fan vaulting similar to interlaced branches, the glass in this sculpture also suggests stained glass windows. Made of corten steel with blue cast glass inserts of butterflies in relief. Looking up there is always a blue sky.